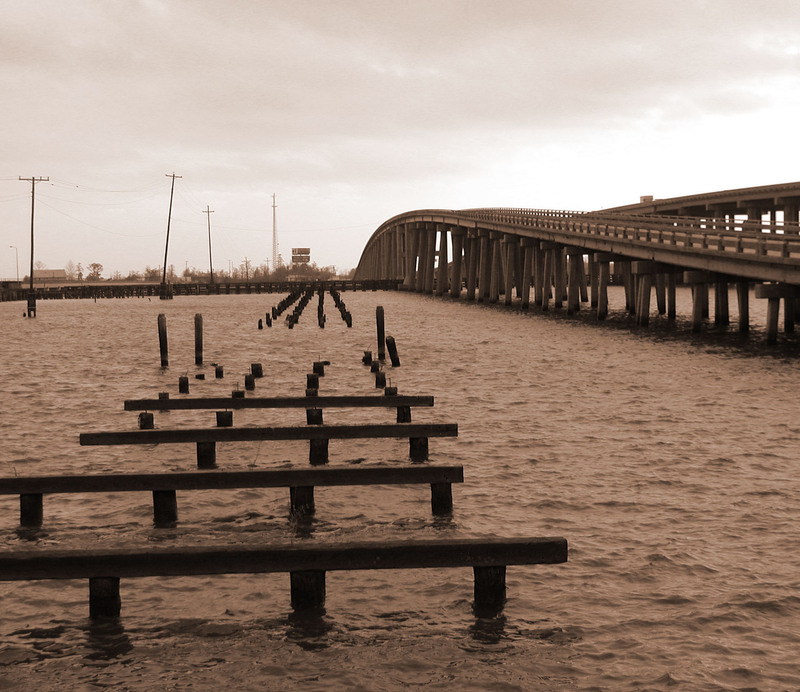 I took this photo of the Lake Pontchartrain Causeway Bridge in Louisiana. I love seeing the original roadway along beside it in the brackish water. Most of my friends who write and create stories do so in a very organized fashion. I know this because during lunch outings when we share our “process” I am frequently met with a look of horror when I describe the deplorable lack of process in my process. For me, the characters come first. The story then reveals itself through the eyes of the characters. The key for me is listening for the characters’ voices. Usually, dialogue arrives first. I’ll be half asleep in the pre-dawn hours and will become aware in my not-fully-awake mind that I’m witnessing a “scene” between characters, almost as if I’m eavesdropping on a conversation. It’s a very strange experience. Usually a scene will come to me in this way fully formed but I might not know exactly where it fits into the story or where the scene will lead me next. The important thing I think is to follow… to not overthink the direction… just follow with trust. Occasionally a scene will lead me into a corner and I’ll be stuck there for a while, facing the wall like a mechanical wind-up toy that has bumped up against an obstacle, unable to turn on its own. But if I don’t panic… and if I’m patient… the exit, the turn, always presents itself. I think over the course of my life I’ve discovered that the most important component to creative work is what happens intuitively once the noise gets turned off in your head. It’s an adventure every time a character’s path presents itself and I follow, having no idea where we will end up. We discover the story together and share the emotional walk equally. Here’s to imagination… the ultimate road to nowhere. What does your creative road look like? I’d love to hear about it. Creativity…imagination…hmmmm. I have to think about this a bit as it morphs from one thing to another over the years…but really never has gone beyond the pedestrian. I’ve always had an artistic bent…once thought I’d get into graphic design for a living, but decided I didn’t want to have to create on demand. I’ve taken lots of art classes and I draw relatively well, when I apply myself…but getting started is the hardest part for me…and it’s never been my passion to do it regularly. I shifted to music for a while, writing songs and playing guitar and ukelele…but again, not a passion that carried me to a point that I wanted to practice enough to improve beyond the casual. I’m not a photographer with in depth knowledge of how to use the tools much beyond their basic settings, but I can still take pretty decent photos, knowing how to frame things to make them more interesting better than many people can. I enjoy turning those photos into little slideshow movies to share with friends or illustrate an event and playing around with website stuff, but again, everything simple and easy. So, that’s my ‘hmmmmm’ when asked about what my creative road is…it’s not one…it’s a lot of little things in little ways that fill the creative void.